Nothing is more classic than Billy Joel’s song “We didn’t start the fire.” Well in Irvine Califronia, one golfer really did start a fire. Forget “Fore!” “Fire!” was the cry of the day for a golfer whose off-target swing sparked a 12-acre blaze in Southern California. The golfer at the Shady Canyon Golf Course in Irvine landed a shot in the rough Saturday. On his next swing, his club snagged a rock, causing a spark that lit the rough ablaze and eventually attracted 150 firefighters to the scene. Fire officials say the fire burned through the rough, into vegetation next to the course and over two dry, brushy hillsides. 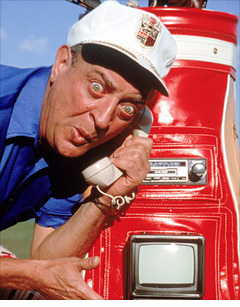 No charges were filed against the golfer, whose name was withheld. 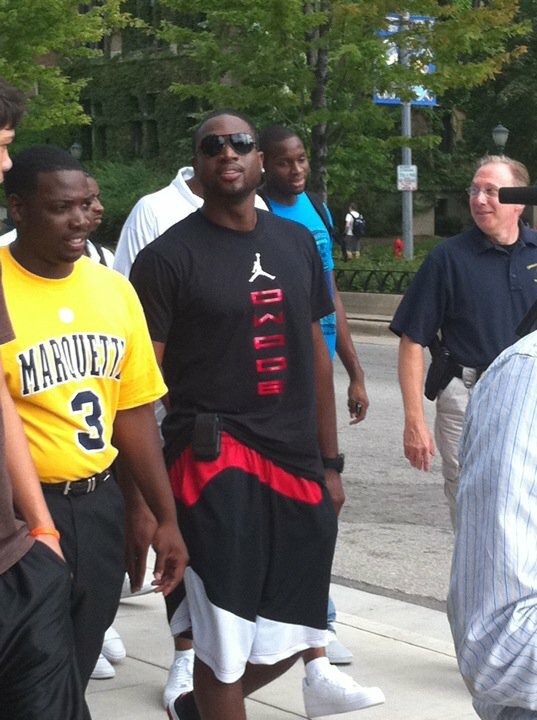 MILWAUKEE (AP) ― Miami Heat star and former Marquette basketball player Dwyane Wade returned to Milwaukee Monday. He met with three teens who received four-year, full-tuition scholarships to attend Marquette University through a national partnership with the Boys & Girls Clubs of America. Wade also spoke to local Boys & Girls Clubs members at the Pieper-Hillside Club Monday afternoon before recognizing the three Marquette scholarship winners. How much longer will he holdout? Exactly one month after they opened training camp, the New York Jets still haven’t seen Darrelle Revis. What does one do when holding out from training camp? Exotic vacation? Take a class at the ‘ol alma mater? Organize your own Fantasy Football league? How about spending time at home? According to the Beaver County (Pa.) Times, Revis has returned to his roots in Aliquippa, Pa., for at least part of his holdout. He’s been working out at a gym in Hopewell under the direction of a former local high school football player who’s now a personal trainer. He’s been seen running at the track at Hopewell HS. He’s been spotted in a convenience store in Center Township. Working out. Running. Shopping. Hanging with family. And making the Jets sweat. The New York Mets have seriously become “The Mess.” They went from almost World Series in 2006 to the years of 2007 and 2008 choke artists. Oh and by the way, in 2009 almost half the team was injured. It has gone from the New York Amazin’s to the New York Mess’ too fast over the past decade. But what do the Mets have to do to bring themselves back to contention? Take a look at these articles that Adam Rubin from ESPN New York wrote about the whole situation. Part 2: What do they do next year in 2011? Jose Reyes – missed 36 games last year after a hamstring injury and has missed a part of the year because with a olblique injury and spring training because of thyroid imbalance in his body. Carlos Beltran– a star in the 2006, 07, and 08 seasons. Got hurt in 2009 and since being hurt in 2010 he is batting .212 with 2 homers and 14 rbis in 40 games and has really hurt the Mets since the All Star break starting the team on their downfall. Luis Castillo – batted .302 last year and was a bright spot for the team but with injuries and inconsistency the past years and terrible defense all year (Ex. Dropping pop up by Alex Rodriguez to lose a Subway Series game last year). Not mention the 6 million they owe him next year as well. Oliver Perez – the man who pitched 194 innings and over 180 strikeouts in 2008 worth earning a three-year deal has been terrible since. He blew out his arm during the World Baseball classic and has been hurt with his knee and an ERA of over 6 the past two years and is a mess. Oh, they owe him 12 million dollars. Billy Wagner – hurt at the end of the 2008 season, pitches well in the second half of the 2009 season, traded to the Red Sox who becomes the set up man and then becomes the closer for the Braves and now has 30 saves with an ERA of 1.65. Why did they get rid of him? Fransisco “K-Rod” Rodriguez – signed him to a big 3 year deal and had an ERA of 6.75 in the second half of the year and just recently beat his father in law and broke his hand and can’t pitch the whole season. Up to now he had 25 saves but his actions were way out of line and the Mets need to do something about it. 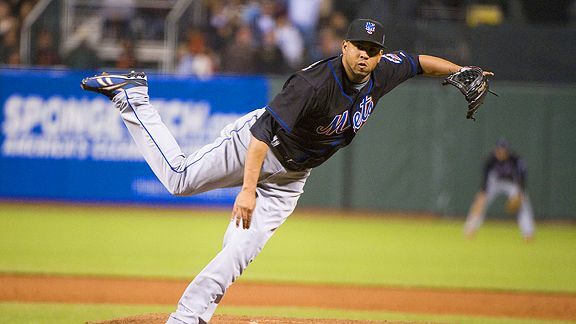 John Maine – this guy was a Met savior in the 2006 and 2007 season and was going to become one of the top pitchers in the league but then had a so so year in 2008 but then got hurt in the 2009 and 2010 season. He has become nothing ever since the injuries and his velocity has been way down. Jason Bay – signed a big deal in the offseason and was looking to help out the Mets offense this year but with a concussion in Los Angeles last month and him striking out and hitting into too many double plays has made this signing look terrible. .259 average 6 home runs and 47 rbis are not numbers that Jason Bay puts up. Something’s wrong! Brett Favre said he will retire from the NFL once in his lifetime. The question is when? The one time Super Bowl champion and 3 time MVP is back for his 20th season in the NFL. The lure of playing in another Super Bowl brought him back to the NFL. Instead, Favre threw an interception in the final minute of regulation. The Vikings never got the ball back in overtime. “I owe it to this organization to give it one more try,” he said. Not that coming back for a 20th season was a simple decision. The expectations always are high for Favre, even at 40. He’s the NFL’s leader in nearly every significant passing category and the winningest regular-season quarterback ever. After staying away from training camp, as he’s done for much of the past two summers, Favre was practicing less than 24 hours after the team sent Steve Hutchinson, Jared Allen and Ryan Longwell, three of his closest friends, to Mississippi to bring him back. Favre underwent left ankle surgery May 21, and just a few weeks ago texted several teammates and Vikings officials that he would not return because the recovery was slower than he expected. “There is nothing on me that’s 100 percent. There wasn’t anything that was 100 percent last year or the year before,” Favre said. “The surgery made me a little better. 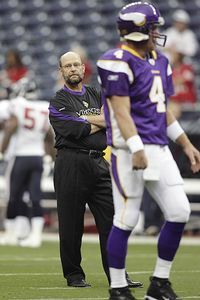 Coach Brad Childress is glad to have him, even with the aches and pains. 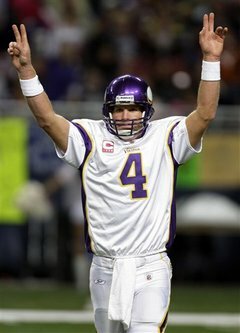 Favre’s return to the field came on the one-year anniversary of the day he signed a two-year, $25 million contract with the Vikings. Childress said he believes Favre when he says he’s done after 2010. “I believe it. Yes, I do,” Childress said. The gray-haired Favre turned in one of the best seasons in a terrific career last year, throwing 33 touchdowns and only seven interceptions to lead the Vikings to the NFC North title. He passed for 310 yards and a touchdown against the Saints in the Superdome, but also threw that fateful interception. After being cajoled by Allen, Hutchinson and Longwell, Favre will have one more shot at redemption and a second Lombardi Trophy. 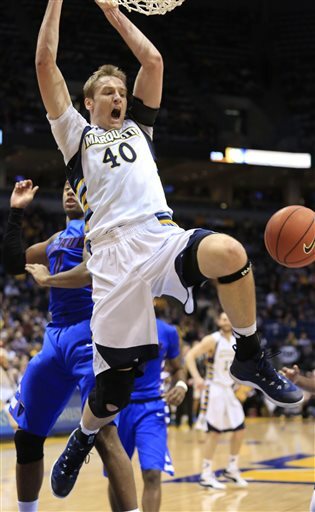 Even though it was expected that he would be back, the same excitement as last year surrounded his return on Tuesday. Fans clogged Viking Drive, and police tried to control traffic and keep youngsters and television cameras from spilling onto the street. Last year, Childress picked up Favre from the airport. This year, Longwell was the chauffeur, and fans tried to mob his black BMW SUV as he pulled into the driveway at Winter Park. “Brett Favre for President! !” receiver Bernard Berrian tweeted. Even though he will turn 41 in October, Favre doesn’t figure to need much time to get warmed up and ready for another season. He skipped all of training camp last year before unretiring and joining the Vikings. The three-time MVP then delivered a season even he didn’t expect. He set career bests in completion percentage (68.4); quarterback rating (107.2); and fewest interceptions, while throwing for 4,202 yards. 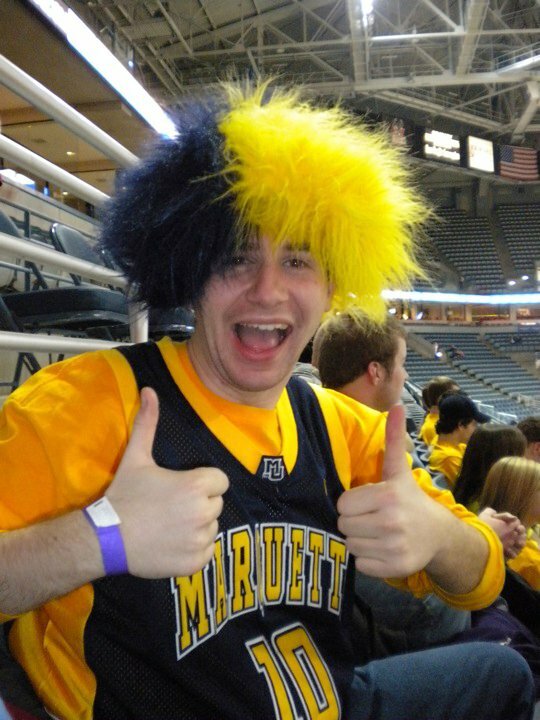 Sorry for the long wait sports fans, but I just moved from my hometown, New York into my dorm room at Marquette University in Milwaukee, Wisconsin. This is where all the writing, video, and audio will be taking place this upcoming year. I am sorry for the wait but the blog posts will be flowing in a few days and look forward to some more action here at The Sports Cycle. Tom Pecora took over the Fordham Rams Basketball program at a time where it has hit a very big low. The team has only one 5 games in two years and went 0-16 in the conference last year. The conference they are in is the Atlantic 10 and it keeps getting stronger each year with more NCAA bids and better talent. How is Pecora going to change the whole dynamic of the program? Well it is a step by step process with a lot of coaching and practicing. 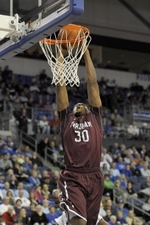 However, he ultimately sees Fordham as a “Sleeping Giant” in college basketball throughout the New York City area. Here is an article that ESPN writer Dana O’Neil on Tom Pecora and why he left Hofstra to build a dynasty with the Rams. To read, click here.